Karness Turner Jr. is a Christian Poet and Spoken Word Artist who was born and raised in Long Beach, California before eventually relocating to Chicago, Illinois. Born on March 20th, 1985 as a product of an African American father and a Caucasian mother, Karness always struggled with his identity, constantly questioning what his role and his purpose was as a member of society. His earliest and most desired aspiration was to become a professional football player for the San Francisco 49ers. After 7 years of playing football, in a preseason scrimmage game, a player from the opposing team hit Karness in the back of the neck with his helmet while he was recovering a fumble, severely injuring vertebrae in the back of his neck. With football being his primary and only source of expressing his anger and frustration of life trials at the time, this unfortunately was an injury he never recovered from physically or psychologically. Devastated by this blessing in disguise, while Karness’ neck injury ultimately moved football out of his future, it ultimately paved the way for poetry! Karness began writing poetry when he was 11 years old. Fascinated by the idea of writing a poem, he began to look words up in the dictionary that sounded like they would make good poems. Thus, his first poem, “Abandoned Love”, followed by his next 14 poems began with the letter A. While he never made it to the “b” section of the dictionary, everybody needs to make their start somewhere, and this was his! While Karness would constantly rap and freestyle as a lyricist in high school, he was reluctant to share his poetry! His insecurity in sharing his poetry a life-changing turn in his Junior year of high school when he worked up the confidence to submit some of his poems to the “Visions Literary Magazine,” his school’s literary magazine. After being rejected by the selection committee the first 4 weeks of selections, with some help from a teacher named Mr. Leonhardi who oversaw the magazine, on the final selection day, his poem “Of A Diamond” was selected to be published in the school magazine. He never looked back from there. His senior year of high school, teachers like Mr. Leonhardi among others helped cultivate and encourage his writing ability. After creating a poetry chapbook for his senior project, Karness’ mother and Mr. Leonhardi both encouraged him to start selling his book for product. Having the hustla mindset that Karness had, he began to sell his poetry chapbook, “Poetic Eyes” throughout his school, and eventually, throughout the state of California. In December 2003, at the age of 18 years old, Karness Turner became an author, published his first poetry chapbook “Poetic Eyes” under Mopheth Publishing. Even in the mist of his major accomplishments at such a young age, his destructive lifestyle eventually caught up with him, causing him to almost lose his life on multiple occasions. In need of a fresh start, Karness and his mother moved from Long Beach, California to Chicago, IL on May 24th, 2004. His inability to access his past destructive lifestyle ultimately caused him to focus on the creativity that he felt eventually saved his life. Turning over a new leaf in his life with his mother, Karness continued to sell his first poetry chapbook, “Poetic Eyes” and would eventually publish his second poetry chapbook, “Convictions of a Stubborn Mind” in December 2004, and his third and most popular poetry chapbook, “Cry Through My Inkpen” in September 2006. He would go on to later record and release his first poetry album, “14 Signatures” on February 28th, 2009, along with numerous DVD’s with his poetry performances including Speak Life DVD Volume 1, and the E’lan Poetry Show, among others. Upon arriving to Chicago In 2004, Karness reached out to a fellow poet friend named Paul Mabon, who put him in contact with the Chicago Poetry Group, “3 Brothers and a Mic” (3BM). As a young and budding 19 year old poet, 3BM poets “Moementum” and “Odyssey” took Karness under their poetic wing, helping cultivate and nurture his craft as a young upcoming poet in the Chicago area. With Karness background as being a Christian (although a very hypocritical one) and 3BM being known publically as a Christian poetry group, Karness, being the youngest of the group at the time, was able to heed to the lifestyle, direction, and wisdom of the elders in the group, which would ultimately lay the foundation for him to cultivate a true relationship with Christ later down the line. In December 2008, his best friend, Glenn Perry, invited Karness to become a part of a poetry group God laid on his heart to create called, “The Spoken Life Project”. Initially hesitant because of his involvement with 3BM, Karness ultimately prayed, got clarity, and was given peace about his decision, and eventually parted ways to join the Spoken Life Project alongside Preston Perry, Glenn Perry, Kevin Perry, Michelle Perry, and Itohan Osaigbovo. It wasn’t until Karness Turner began working with the Spoken Life Project that he realized the importance of living the lifestyle that he preached in his poetry. While Karness was arguably the most talented writer and performer when he joined the Spoken Life Project, he realized very quickly that he was the weakest spiritual link in the group. This was the first time Karness was surrounded a group of people who held him spiritually accountable for his words as well as his actions. Thanks to their persistent accountability, Karness’ relationship with Christ began to flourish, helping him ultimately realize the different between being a poet who happens to be a Christian and a Christian who happens to be a poet! His repertoire of accomplishments are too numerous in quantity, having traveled, performed, and ministered in over half of the states in this country. 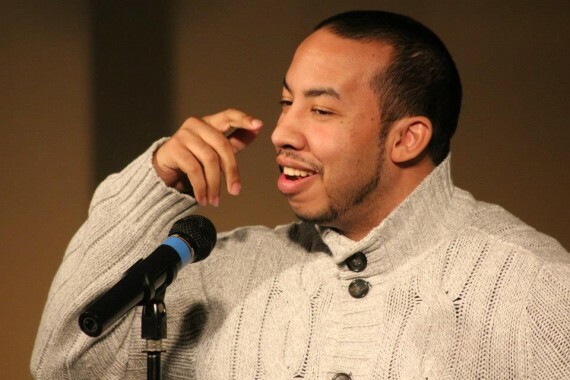 Some of his accomplishments include being the Head Poetry Coach for the 2008 Brave New Voices Stockton Team, 2006 Palatine National Poetry Slam Team Selectee, semi-finalist in Step To The Mic Poetry Competition 2004, 2003 1st Place Long Beach All-City Slam Champion, named an honorary P4CM Poet in 2010, 2010-2011 Poetry For The Soul Host, honorary Hip Hope International Member 2011, With Our Words (W.O.W) Non-Profit Board of Directors, and the Head Organizer For The Speak Life: Chicago Christian Poetry Event, among many others. Karness currently resides in Forest Park, Illinois right outside of Chicago. Along with being a poet and spoken word artist, he is also an author, actor, event coordinator, and playwright. He is also the COO for Spoken Life Project LLC and is currently working on his 4th poetry chapbook, his second poetry album, and writing his first screenplay!